I am so excited that The Chili Cook Off is finally here. I just love this time of the year when we get out our Chili recipes and get ready for a nice cozy bowl of Chili. We are expecting some great bowls of Chili this year and I am so excited that you are sharing your Chili with us today, we can't wait to taste it! 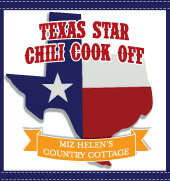 You Are The Judges, Your Page Views Will Determine Your Favorite Bowl Of Chili For 2012 ! Thank You So Much For Sharing Your Chili With Us! This is so much fun! Thanks for hosting the Chili Cook-off! I had fun participating in last year's chili cook off. I'm looking forward to getting some great new recipes. Thanks for hosting again Helen! Thanks for hosting, Miz Helen. Chili is my absolute favorite food - So I am looking forward to all the great recipes! This looks like a fun party! Can't wait to seeing all the different recipes! How fun is this?? Thankfully, I discovered the best chili recipe of all time last winter! :-) Thanks for hosting! I love BBQ shrimp so I want to make sure and try Lisa's chili. I have been priiledged to eat at her home, and she is one fine cook. Miz Helen, I have shared my Beef and Black Bean Chili. Thank you for hosting your Texas Star Chili Cook Off! Hi Miz Helen, I just entered my chili recipe that I tried while our son is here. Thanks for hosting this annual event! Thank you Miz Helen for hosting..I've cooked up some old fashion Grandma's Chili Soup...this was so much fun! Just entered -- thanks for hosting, Miz Helen!!!! OH my gosh! This makes me so hungry! Everyone's submissions looks delicious. I've never tried a Verde Chili, that sounds deliciously different! I joined in with a Beef Chili with Ancho, Mole and Cumin. Family favorite so far. Looking forward to trying some of these recipes! They all look delicious. Came back to add a really delicious Buffalo Chicken Chili.